I don’t know why, but I have been having some issues in the kitchen lately. Burnt butterscotch, chocolate blooms, spilled food, cracked cakes, depleted food stores… you name it. I’m in some kind of food funk, so I guess I’ve been avoiding the kitchen for a couple weeks. I re-entered carefully a few nights ago, trying out a new semi-homemade recipe I got off the back of a bag of Nestle Tollhouse butterscotch chips. Even this proved challenging for some reason, though the end result turned out tasty. I edited the recipe a little bit to include chocolate, since a dessert isn’t really a dessert unless chocolate is involved (and I ran short on butterscotch). I’ll go through how I made it, but word of warning: be sure to have quite a few medium and large bowls on hand, and preferably someone to wash all these dishes for you. I started by pre-heating the oven to 375 F and buttering a bundt pan. 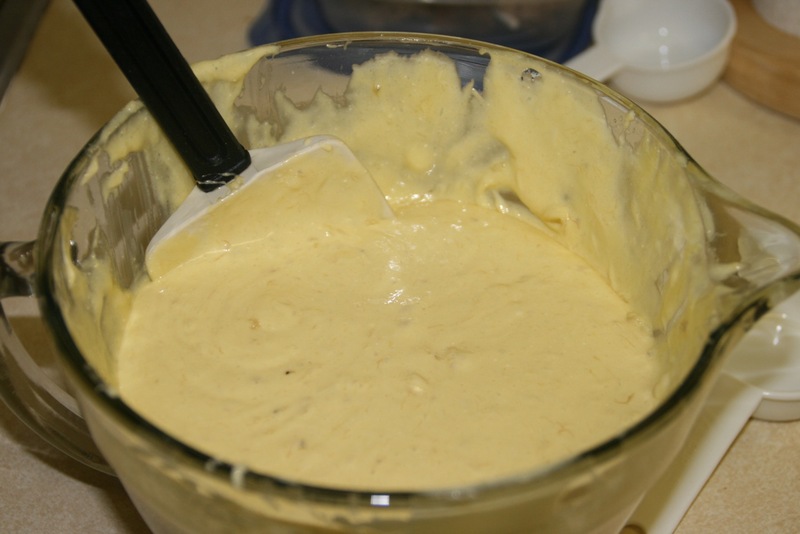 Then I filled a large mixing bowl with a box of yellow cake mix, 4 eggs, 1/2 cup vegetable oil, 1/4 cup water, and 1/4 cup white sugar. 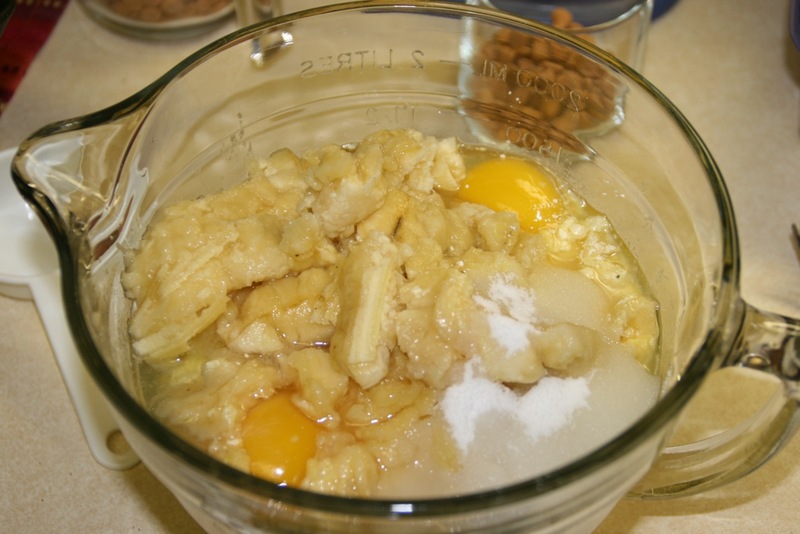 I also added in 2 mashed bananas — I didn’t worry too much about mashing them well. I just kind of shmushed them with a fork as I dropped chunks of banana into the bowl. I figured the hand mixer would take care of them. 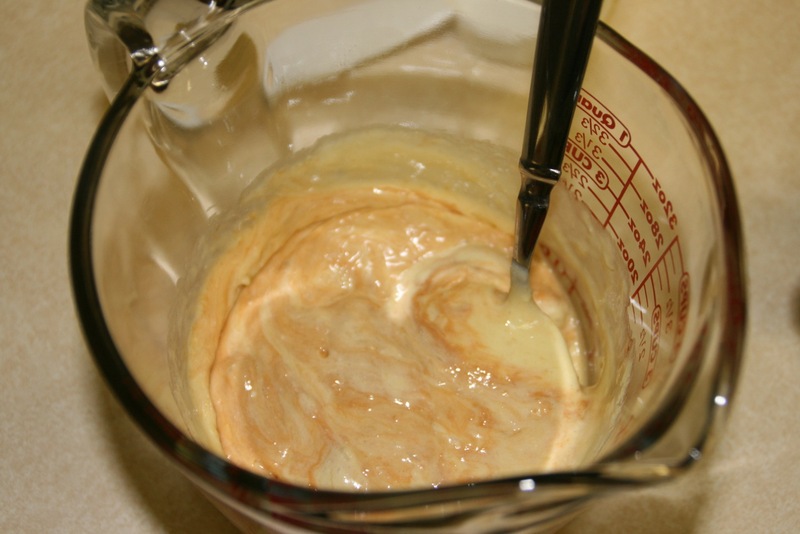 Then I mixed everything together with a hand mixer in medium-low speed for about 3 minutes. In a medium-sized, microwave-safe bowl, I melted 3/4 cup of butterscotch chips by cooking at 20-second intervals in the microwave, stirring in between each round. I did the same thing with 3/4 cup of dark chocolate chips in another medium-sized, microwave-safe bowl. I added about a cup of the banana cake batter into each of the melted chips bowls. 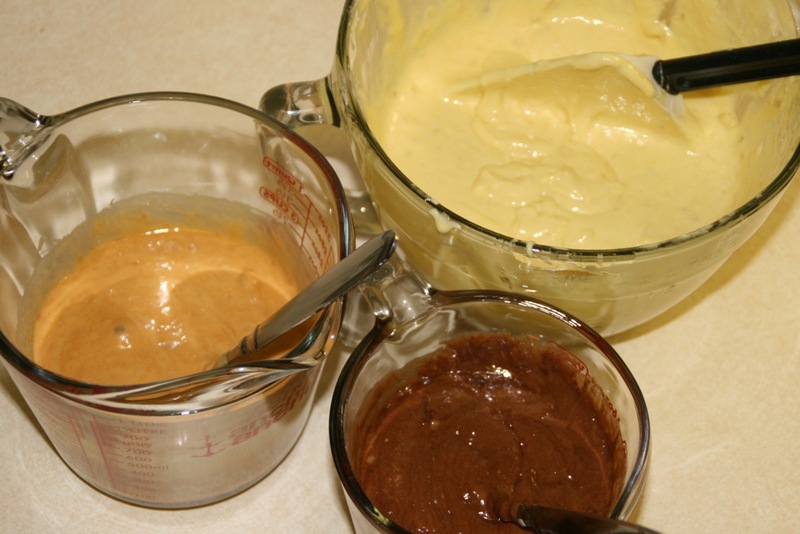 So then I had: a bowl of banana batter, a bowl of chocolate-banana batter, and a bowl of butterscotch-banana batter. 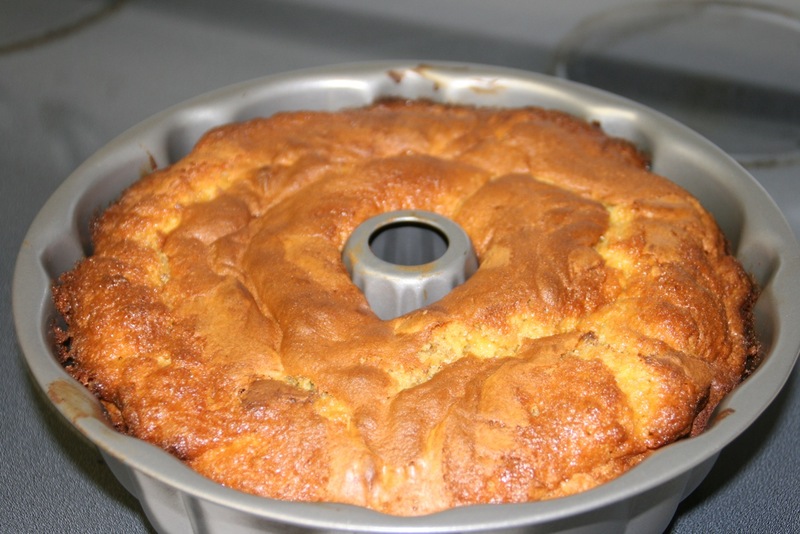 Then I set about filling the bundt pan in a way that would give me a great marbling effect. 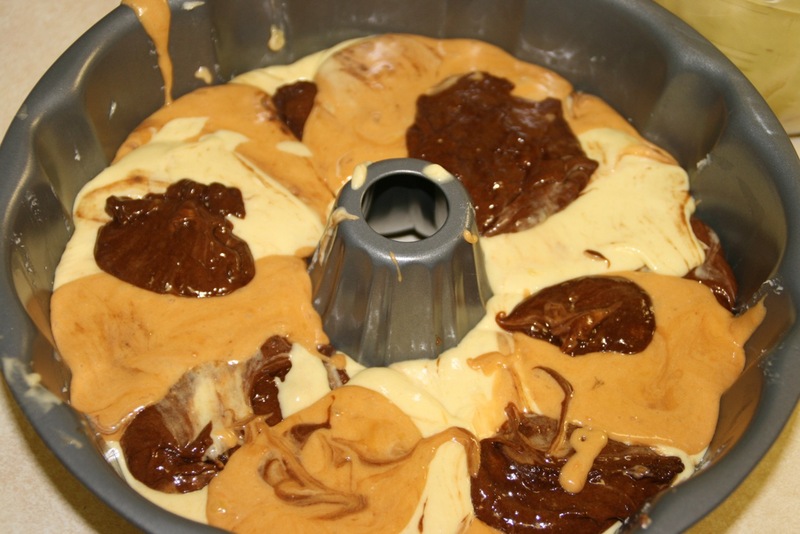 I just dropped random spoonfuls of each batter into the pan: spoonful of banana, spoonful of chocolate-banana, spoonful of butterscotch-banana… repeat. The bowl looked pretty cool, with yellow, brown, and tan spots everywhere. Once the pan was full, I put it in the oven for about 35-40 minutes, until I poked it with a toothpick and it came out clean. Once again, I was too impatient, and I tried to take the cake out of the pan too soon, resulting in a cracked cake! And this time I didn’t have an icing to hide the cracks! BAhhh what was I gonna do!? Easy — I just cut it into two halves, and served it as two separate cakes. Where the cracks were messy, I just sliced off a bit of crumbled cake and ate it, so that the edges would be smooth cuts. This worked out really well since I was taking some to the office, and they never eat it all anyway. So I sent one to my office and one to the BF’s office. But first — the topping! The recipe called for drizzling melted butterscotch over the top of the cake. Unfortunately, I completely burned and ruined the last bit of butterscotch I had, so that was a fail. (Told you I’ve been having kitchen issues lately.) So instead I topped it with melted chocolate, which is a fantastic substitute. (Even that took two tries though. Issues.) 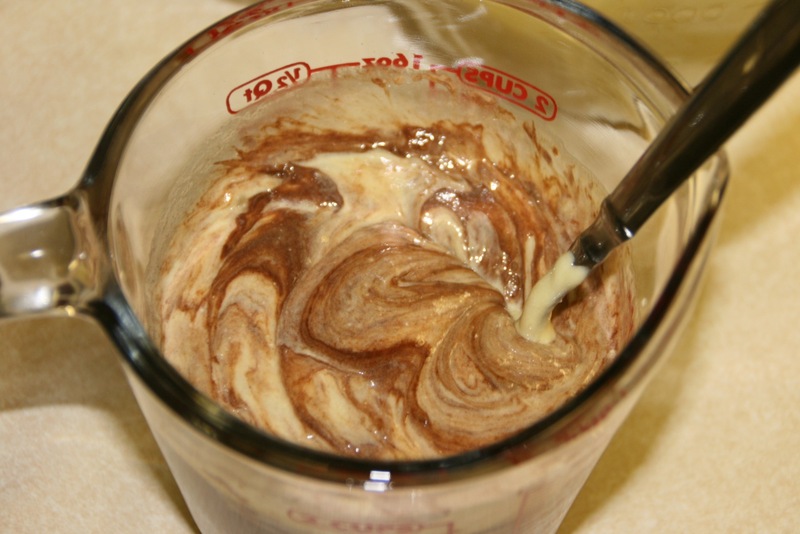 This is the same ganache-y topping I use on my Chocolate Chocolate Chocolate Cake. The general rule is one part butter to two parts chocolate. So I melted about 1/2 cup semisweet chocolate chips with 1/4 cup (1/2 a stick) butter, heating in the microwave in 20-second intervals, stirring well in between each round. 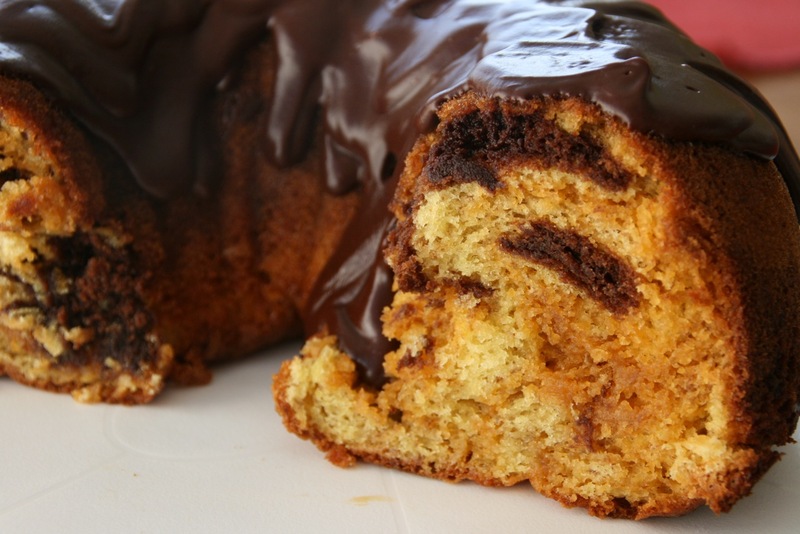 While the chocolate is still warm and smooth, drizzle it over the top of the cake, evenly all around. As it cools, it will firm up to be solid, but it won’t get hard, thanks to the butter. Tasty! – If you prefer only butterscotch and not the added chocolate (not sure why you would, but whatever), just replace all the chocolate with more butterscotch. – Reviews for this cake were mixed — some loved it, some liked it, some didn’t care for it. I think it totally depends how the taster feels about banana. If you like banana, you’ll love this cake. 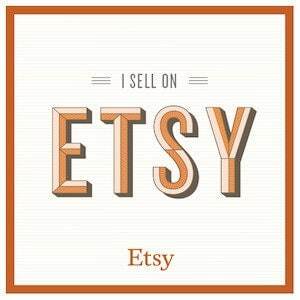 If you don’t, you won’t. Duh.